There are a huge number of needlepoint stitches available. So how do you choose which ones to use for your design? Many stitch names actually refer to a group, rather than individual stitches. For example, Gobelin stitch is basically a straight line, i.e. the needle comes up through a hole in the canvas and down in another one. Depending on how many threads the stitch covers, the direction, and where the next stitch is placed, this simple line can be known by various names. A stitch is worked either vertically, horizontally or diagonally. Which of these we choose for a particular area of our design can be important, especially if it is pictorial in nature. We may wish to work diagonally, for example, if we are depicting the slope of a hillside. A building, on the other hand, may work better if the stitches are vertical, otherwise it may appear to be falling down! Not all areas of a design need to show direction as that could be distracting. Often background areas work best if they appear random, or flat (we will discuss texture shortly). A basic stitch comes up through the canvas, and then down again in a different place. It can travel over a single canvas thread or multiple threads. Those that are taken over a low number are smaller stitches. However, many needlepoint stitches are actually a combination, sometimes taken over differing numbers of canvas threads. When we talk about size, we are referring to the area that combination covers to make one complete stitch pattern. This means that when stitching something in Mosaic Stitch you will fit a lot of stitches into an area. If you were to try to fill the same area with Milanese stitch it wouldn't work in the same manner. The larger stitches require more space in order to "make sense" and show to their best. Some stitches take up the same area, such as the Mosaic and Rice shown in the diagram above. Some needlepoint stitches can be said to be rectangular, square, octagonal, diamond or leaf shaped. Thought should be given as to how these "blocks" of stitches will fit into an area. Often there will not be enough space at the edge of an area to complete the block, and compensating stitches will have to be taken to fill the area available. Other times you will want to consider what the section of the design is representing. 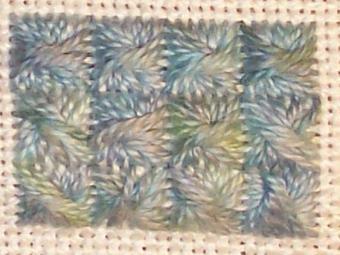 If it is a tree, then a leaf stitch would be appropriate whereas a square "tiled" pattern, such as Scotch, may look odd. Needlepoint stitches can be smooth or bumpy. I like to keep the background areas smooth, and utilize texture for the foreground elements. Where one (or more) thread crosses over another it creates bulk and effectively brings that area closer to the viewer. 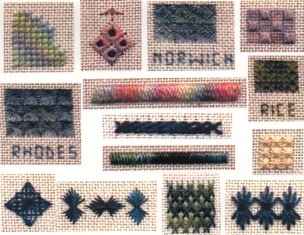 Bumpy textured stitches include Rhodes, Rice, Cross, Leaf, Fan, Norwich and French knots. If you want a smoother appearance go for Tent Stitch, Hungarian, Byzantine or Gobelin. Another way to create texture is to form a pile, which can either be cut or left looped. Velvet stitch would be an example of this kind of work.